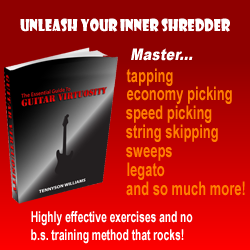 So what is the most important skill that most guitarists do not have? Some would claim that it is thorough knowledge of music theory. Others would say that the most important skill is creativity. Of course there are whole legions of guitarists that believe having impeccable technique is the holy grail of guitar playing. Maybe you agree with one of the statements above, or maybe you think it is something else like, songwriting, playing with others in a band or having perseverance (check out my past article on perseverance). All of the skills mentioned above are crucial to the development of any player that really wants to become an excellent guitarist and musician. But the single most important skill that most players don’t have, and don’t know how to practice, is Ear Training! (also known as aural skills). We are dealing with music here right?! How do most of us enjoy making music? By listening to it! So why is it that most guitarists have poor aural skills (an unskilled ear). Non classical guitarists have traditionally played by ear, but surprisingly most of these players’ ears are still not as good as they could be and should be. I’ll use myself as a classic example of a player that used to severely lack good aural skills. Before I began my formal music training in college, I thought my ear was pretty good. I could usually learn songs by ear quickly and my improvising skills were ok for the time. But whenever I wanted to compose a guitar solo for a song or write my own songs I ran into problems. I always felt as if I couldn’t get the music that heard in my head to come out in the music I was playing. I usually had very good technique and my knowledge of basic music theory was not bad but my creativity was suffering greatly. Everything I improvised or wrote came from my hands and my knowledge of chords, scales, etc. I wanted to do more. I wanted to be more unique, more creative and most importantly, more self expressive. I was aware that a problem existed, but I did not know that the specific root of the problem. I assumed that I was just not a very creative person and that my (assumed) lack of creativity was permanent and beyond my control. I believed that I was just not naturally gifted with creativity (refer back to my article on perseverance). In the fall of 1994, I enrolled at Harper college as a music major. In addition to many other requirements, all music students are required to complete 2 years of Aural Skills classes. It was not long after I went to my first aural skills class that I realized how much my ear needed more training. Fortunately I had a very encouraging teacher who knew that guitarists often had problems with aural skills. After the first semester (1/2 year) I realized that my problems related to creativity (improvising, songwriting / composing, etc.) were improving and more importantly, I realized that my problems were NOT due to a lack of creativity. They were due to the fact that my ear had not been developed enough to release all of my creative potential! This realization was one of the most single greatest moments in my musical life. I felt liberated in knowing that I really do have creative talents. Then all I needed to do was train my ear further so that my creative ideas could then manifest themselves into my music. There are lots of ways in which you can improve your aural skills. I’ve listed many of them below. The idea here is NOT to pick just one of these ideas from the list and expect miracles. Do as many of these things as you can, as often as you can. 1. Transcribing (figuring out by ear) songs, chords, melodies, solos, etc. using your guitar. 2. Transcribing without using your instrument (write the music down on paper and then when you think you have it as close to accurate as you can get it, check your work with your guitar. Notice what errors you made and look to see if a pattern forms in your errors. For example, if you realize that you always think that minor chords sound like major chords then you can see that this is something you will need to focus your practice time on. 3. Sing (yes sing out loud) scales. Start with singing the major scale, later add the natural minor scale, harmonic minor scale, pentatonic scale, blues scale, the modes, etc. 5. Sing arpeggios (chords – one note at a time) start with major triads and then move on to minor triads. Later should try other types of chords. 6. Sight singing (you will need to have a basic understanding of reading music to do this) You can use any piece of sheet music for this. There are many sight singing books that you can buy if you want to, but really any music will do. 7. Transcribe rhythms. this is just like transcribing a melody, but the focus here is on writing down on paper the rhythm only, don’t worry about the pitches for this exercise. 8. Improvising melodies, solos, etc. over chords. This is a great thing to do anyway. 9. Imagine a 3 or 4 note melody in your mind and then try to play it on your guitar. Repeat this many times with different melodies. 10. Record yourself playing lots of different chords (just major and minor triads for now). Try not to repeat the same chord very often. Play back your recording and then try to identify whether the chords you hear are major or minor. 11. For those of you living in the United States, your local community college or university, that has a music department, typically offers basic aural skills classes that may be open to the general public. Community colleges often charge a very low fee for this class. I am not familiar with how this works in other parts of the world, so non US citizens should check this out with your local colleges. 13. For those of you who may not be able to enroll in an aural skills class, I strongly recommend to seek out a private music teacher. The good thing about seeking a private teacher is that the teacher does not need to be a guitar teacher. Any competent music teacher (no matter what instrument the he or she plays) can teach you aural skills. The key is to find a competent teacher though, there are a lot of incompetent teachers out there. For help on finding a good one and avoiding the bad ones, check out my previous article titled: Choosing a Teacher. Ear training is critical to any musician’s development as a musician. Remember to persevere and be patient with yourself as your ear develops. Expect progress to be like your physical guitar playing, slow but steadily moving forward each day. Your ear needs constant practicing just like your hands do, so don’t neglect the most crucial tool that you have…… your ears! Copyright 2002 by Tom Hess. All rights reserved.